While we’re all currently in the thick of piano lessons, the end of the term will sneak up on us. In the blink of an eye, we’ll be asking families if they’ll be coming back for lessons after the summer. When you depend on teaching piano to put food on the table, waiting for families to let you know if they will be returning can be an anxiety-ridden time. 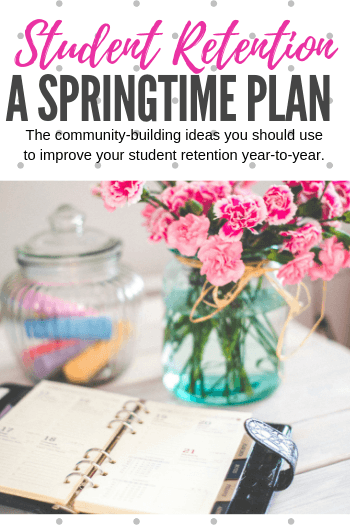 Fortunately, you have at least two months to kick your loyalty-building activities into high gear and guarantee that you’ll have a healthy teaching schedule next fall. If you want to take the panic out of piano re-registration season, you’ll want to read about our 7 loyalty-building activities and then put them into action in the coming weeks. Building community around a business is the essential ingredient to creating loyal customers. When people feel like they belong to a business’ community they will become your greatest advocates and your devoted clients. Building a community around a piano studio presents unique challenges. Unlike many businesses, organizations, or classrooms, the people who are part of your piano studio rarely congregate in person. The one-on-one nature of piano lesson thus makes building a community around a piano studio a challenge. But it can be done… and if you want to make to happen before re-registration season you’ll want to start immediately implementing some of the ideas below. We’ve included a wide variety of ideas for a wide variety of teaching personalities. If you can manage to include three of the following activities before May, you’ll be in good shape! If you are a parent with school-aged children, then you are probably very familiar with Pink Shirt Day or Twins Day or Pajama Day or Crazy Hair Day. While they seem simple (and sometimes ridiculous) to parents, kids go crazy for these types of events. The shared joy of a goofy clothing day in your piano studio will definitely give your piano students a sense of community. The key to making a goofy clothing day work is ensuring there is some musical relevance behind the goofy clothing. For example, consider hosting a goofy wig day. Powdered wigs were pretty fashionable amongst classical composers so encouraging your kids to wear a goofy wig (it doesn’t have to be a powdered wig) can serve as a jumping off point to classical music studies. Community building is all about connecting students with other students. A way to accomplish this task without any additional scheduling and very little after-lesson organization is to host a week of “Next Student” Mini-Concerts. The concept is as easy as it sounds. The student whose lesson is ending performs one piano piece for the student whose lesson is just about to begin. Because re-registration happens around recital time, this idea will also help your students get their piano pieces performance ready. Since we just talked about getting students ready for recitals, it makes sense to share another idea that prepares kids for performances AND builds community. You are, no doubt, very familiar with practice challenges. They are a staple in studios around the world. Team practice challenges, however, are much less common. As the name suggests, a team practice challenge is a studio-wide event that has groups of students competing against one another to complete the greatest number of practice days. Team practice challenges can be more effective than individual practice challenges, as students will feel responsible for the other students who make up their team. The beauty of a team practice challenge is that it connects students to other students but does not require in-person activities that require you to try to work around the schedules of multiple families. Kids will amaze you when giving the opportunity to work together for a greater good. With a studio philanthropy project, you can build community and some good karma at the same time. Because spring is a busy season for piano teachers, choose a project that is simple and achievable. Consider a practice pledge project where students take monetary pledges from family members and friends if they achieve a certain number of practice days or spend one day on a weekend putting on a concert at an Extended Care Facility or Retirement Home. The spring is a particularly good season for your piano students to visit a retirement home. Unlike the Christmas holidays when the elderly have many events and opportunities for entertainment, the springtime can get lonely. Use your community of piano students to make the spring a wonderful season for people whose days can be brightened by young faces and music. Employing “big buddies” in your piano studio will ensure that your community-building efforts last beyond your current generation of piano students. A Big Buddy program does not have to be complicated and it does not have to run year round. Begin by hosting a Big Buddy Week where older students come to your younger students’ lessons to play games and duets. Every student does not need to have a big buddy. In fact, for ease of scheduling, I suggest choosing one teen student for each day of your Buddy Week to be a special helper. Structured in this way, your Monday teen student can then serve as the big buddy for every little student that comes to your studio on Mondays. This program will work really well if you have teens who aspire to be teachers or need volunteer hours for a graduation program. Community-building activities do not have to take a lot if time and effort to be effective. A musical movie night where kids come to your studio to eat popcorn, watch a movie like The Sound of Music and engage in a quick game or singalong is all it takes build loyalty with the families in your studio. Movie nights are a wonderful way to connect with studio families and can be as simple or as complex as you wish to make them. However, by keeping them simple and holding them at more regular intervals you will benefit from the loyalty that arises when students are kept in constant contact. When Harry Potter first hit the shelves in the late 90s it created a unique phenomenon where kids recommended it to other kids. Harry Potter grew in popularity due to a child-centered community; it became a “cool club” that kids wanted to join. You can create a similar community by using creative supplementary repertoire that kids will “just have to play” when they find out other kids are playing it. We have published many different resources that will work well for this type of community building, including The Adventures of Fearless Fortissimo, or our classical pop crossovers for teens including The Beethoven Sessions, The Chopin Sessions, and The Amadeus Anthems. How Do You Build Community In Your Piano Studio? Can you add to our list of community-building ideas? If there is something unique or creative you do to bring your piano studio closer together we would love for you to share it with the Teach Piano Today community in the comments below!